You know those Arcadia Publishing Images of America local history books? I’m talking about the sepia-toned paperbacks about a single city or region, filled with pages of old photographs and local lore. I love them. After I started researching El Camino Real I became slightly addicted to them. I couldn’t go into a bookstore without gravitating towards Arcadia’s distinctive displays and very often walked out with one or two books. I at least had the self-control to limit myself to California cities on El Camino, but more than once I brought home books only to find out I already owned them. Mockery from my wife has prompted me to make a Google bookshelf of all the Arcadia books and other books I’ve accumulated about El Camino Real and California history so far. It will help me prevent duplicates, but beyond that it’s cool to see my whole collection in one virtual place. I have 33 books in the list as of this posting, but I know I’ll be adding more. I own most of these titles, some I’ve gotten from the library, and the rest I’ve just heard about and hope to read some day. Fact is I’ve only read three of them cover-to-cover; the rest I just thumb through or look at the pictures or use for reference. That’s how I end up with duplicatesit’s hard to remember I have a book when I haven’t read it yet. Here’s a brief overview of a few key books on the list. I have twelve Arcadia books, all unique. (I returned the duplicates.) The first one I bought was San Jose’s Historic Downtown. I bought it years ago, before All Camino, simply because I live in San Jose and was charmed by the book. I shortly went back and bought Milpitas because I work there. The rest I picked up after starting the blog. As I said they’re all cities on some branch of El Camino except strictly speaking Alviso, San Jose, which is so closely interrelated to its El Caminoed neighbors that it is included honorarily. Besides, Alviso, San Jose was written by the same guy who wrote Milpitas, Robert L. Burrill. There are several eligible books in the series still that I don’t have like San Francisco’s Mission District and Colma, not to mention cities outside the Bay Area. I suspect they’ll find their way onto my shelf eventually. The Alameda: The Beautiful Way is noteworthy because it is the only one whose author I’ve met, and I got it signed. Bay Area native Shannon E. Clarke researched, wrote, and designed it while an undergrad at UCLA and it’s a remarkable achievement, a comprehensive and indispensable historical account of my favorite El Camino stretch. I bought it on the Fourth of July, 2009, at the Rose, White, & Blue Parade and Festival. Shannon was leading bus tours of historic The Alameda and the Rose Garden. I missed the last tour, but she was kind enough to give me a quick virtual tour using one of the book’s maps as a guide. I hadn’t launched the blog yet, but finding this book was the spark that inspired me finally to get it off the ground. California’s El Camino Real and Its Historic Bells is golden because it’s the only book I have that is explicitly about El Camino as a road, literally telling the story of its route, passability or lack thereof, and commemoration. What it lacks in polish it more than makes up in dedication, and it contains information you can’t find anywhere else. It’s one of the books I’ve read in its entirety. If Junípero Serra is the father of El Camino Real, Mrs. A. S. C. Forbes is the motherwith apologies to Mr. Forbes and the Franciscan order. You’ll have to read the book to learn more about this dynamic woman. Another book I’ve mentioned a few times here is Deep California: Images and Ironies of Cross and Sword on El Camino Real. It’s an unusual work because it espouses the notion of terrapsychology, the idea that the Earth literally has a psychology and that ecological features like land masses, water bodies, and climate are outward expressions of this inner soul. Since (most) humans are from this planet, we are subconsciously attuned to this psychology and play out its archetypical facets through our individual and societal behaviors. If we act contrary to nature, it reacts in kind. It’s a powerful idea, and the book is a fascinating colorful romp through the stories of California, picking out recurring themes from the human realm that reflect deeper root causes of place and pointing out the mistakes of the past so that we may learn from them. This book means a lot to this blog because it validates the approach I’ve taken, that there is a different way to tell the story of El Camino Real: that the road we experience materially may be interpreted symbolically as a path to deeper truths. As I read Deep Californiafront-to-back, and it’s bigI realized I knew very little about California history. I didn’t know Portolá from a pueblo or De Anza from adobe. How embarrassing. Every California schoolchild learns state history in the fourth grade (mission projects!) and I remember seeing this stuff in my son’s social studies book when he was in that grade but I don’t remember what I read in mine a generation prior. So I had a brilliant idea: I bought two grade school textbooks, Oh, California and Social Studies: California Edition, both published by Houghton Mifflin. One of them is used which makes it very special. (Thanks, Kris, wherever you are, for your responsible stewardship, and I promise to provide the same.) They are a gentle introduction to a daunting subject, they represent at a curricular level what the state believes every citizen should know, and they contain plenty of colorful graphs and pictures. I like pictures. I may not be smarter than a fifth grader, but with these books close at hand I at least have a shot at holding my own. A last few mentions. Historic Spots in California is I believe the California Bible, and Clyde Arbuckle’s History of San Jose is the San Jose Bible. Historical Atlas of California turned me into a mapaholic overnight. The Labors of the Very Brave Knight Esplandián, a romantic novel written around 1500 by Garci Rodríguez de Montalvo of Spain, is the origin of California’s name. It includes an account of Calafía, the fierce black Amazon queen of the then-fictional island California, who wore armor made of gold as she battled the handsome Catholic hero Esplandián in the first bloody Crusade. She was defeated honorably so she subjected herself and her queendom to Christianity. Allegory much? Each time I crack open one of these wonderful books I learn something new. The story of this great state is rich and enlightening, but impossibly complex. Studying how El Camino Real slices through it all is an effective way to get a clarifying cross section of history. Moreover the more general a book is, the more carefully I have to comb through it to find information specific to the road, and the more rewarding and thrilling is each golden find. I wish for the time and patience to someday read them all. Unless they make a movie first. 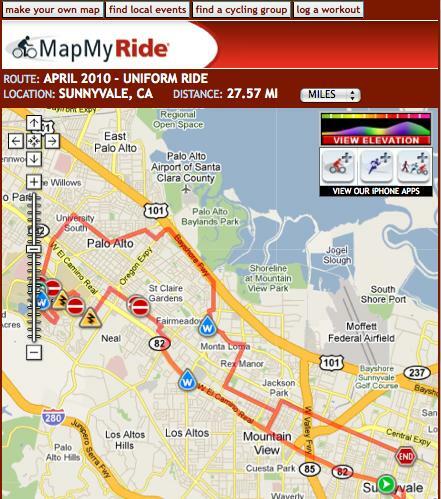 Friday night, April 16, 2010 San Jose Bike Party hit the El Camino Real, bringing their two-wheeled high jinks to Sunnyvale, Mountain View, Palo Alto, and Stanford. 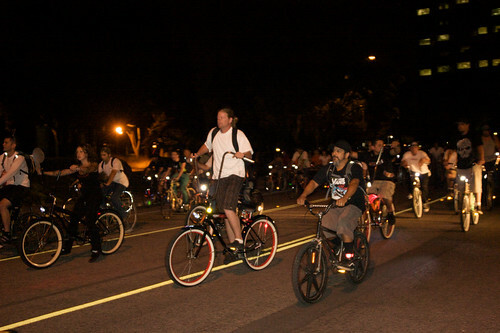 Bike Party is a volunteer group that organizes monthly bike rides through the streets of the South Bay, attracting hundreds of riders. In contrast to the edgier and more confrontational Critical Mass, Bike Party seems to be a more festive and light-hearted event, but still a serious ride. Friday’s route was 27.57 miles long. I first heard of Bike Party last year when they rode past my house in the middle of the night. I was asleep in bed when I was awakened by a couple neighborhood dogs barking their heads off. I could hear voices and strange mechanical noises coming from outside in the street. That’s not so unusual; it’s a busy street and occasionally we’ll have boisterous pedestrians or vehicles going by. But this time the noises didn’t stop and the dogs kept on barking so I went to the window to see what was going on and slipped into the Twilight Zone. There were bicycles rolling down the street. Wave after wave of bicycles. Dozens of them. There were mountain bikes, road bikes, stunt bikes and beaters, riders in costumes, hipster types, and nerds in reflective vests. I thought I was dreaming. I went outside in my pajamas and found a couple teens from the neighborhood already standing on the curb, watching the spectacle. 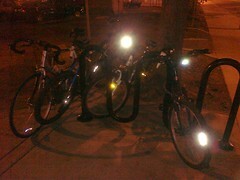 They’re the ones who told me it was Bike Party, being much hipper than I. When I learned Bike Party’s route this Friday included a big chunk of El Camino, of course I wanted to go see the fun and maybe take some pictures. However we went to the anniversary celebration at Calvin’s and I stayed too late enjoying the festivities so by the time I got up to Palo Alto the ride was pretty much over. I saw a few isolated stragglers but hardly enough to constitute a party. I stopped to chat with two riders fixing a flat tire who told me they estimated there were a thousand riders out. I asked how the ride on El Camino was and they replied, “too many cars.” Fair enough. I reflected on how tragically unhip I am. I drove my car to try to get a look at a celebration of bikes, and missed the whole thing. Ironic and sad. I drove over to the ride’s end at Sunnyvale Town Center and strolled up and down South Murphy Avenue to see if I could spot any riders enjoying a post-ride beverage at the many nighttime watering holes there, but all I saw was this well-populated rack. As it so happened several bars had the Sharks’ hockey playoff game against the Colorado Avalanche at HP Pavilion on their TVs, and as I was walking back to my car I heard the whole street erupt in cheers as Devin Setoguchi scored the game-winning goal in overtime to even the series 1-1, thrilling the home crowd. Friday night on El Camino the good times just rolled. 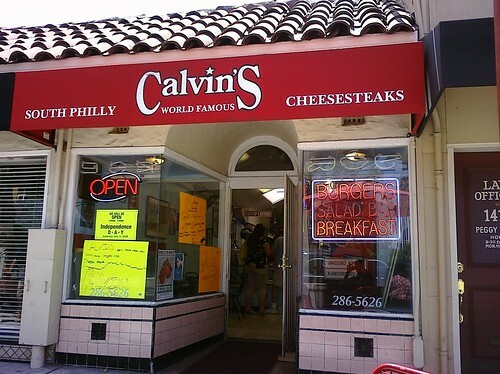 This is a big weekend for Calvin’s Philly Cheesesteaks on The Alameda in San Jose. They’re celebrating their second anniversary at that location. There will be raffles, entertainment, and new menu items. There’s so much going on, the most difficult thing is deciding which day to go. But wait a minute, who says I have to choose only one…? Newsflash…Calvin’s is opening a second location at 1699 W San Carlos in San Jose soon! I like to think of San Carlos/Stevens Creek as the Second El Camino of the South Bay. As it so happens our family was in Philadelphia for one day last week and we stopped at Geno’s Steaks, the South Philly Cheesesteak institution, to give them a try. The sandwich was very good and served up really fast…but Calvin’s is better. Plus Calvin makes a mean hoagie. We’re fortunate to have him in San Jose. Calvin’s South Philly Cheesesteaks and Hoagies will celebrate our 2nd year anniversary at this location 1411 The Alameda, San Jose, CA 95126. We would like to invite you to participate with us starting Friday April 16, thru Sunday April 18, 2010. We will have a weekend filled with Great Food, Entertainment, Free Giveaways, and much more. Join us for a special tasting of Dietz & Watson awarding winning Hot Dogs and Deli Meats. They are a Philadelphia staple and have been around since 1939. Special Raffle drawing every hour. Calvin’s is pleased to host a special Fundraising Event for “A Cup of Cold Water.” This is a non-profit organization providing health education to the community. They teach you what doctors are too busy to explain. The evening will feature hors d’oeuvres, a raffle with wonderful gifts, entertainment, free ice cream provided by Treatbot, free samples from Calvin’s new menu. Make sure to take a picture with Calvin to remember this special event, photography provided by Definitive Images, and there will be many more surprises throughout the evening. You don’t want to miss the kick-off to the 2nd year anniversary celebration! Join us as we give back to the community! Join us as we introduce new specialty meats by Philadelphia’s own Dietz & Watson. One of life’s more mysterious delights is synchronicity, those moments when you experience a startling coincidence that impresses your instinct as having special meaning that may defy logic. I’ve been enjoying several of these “whoa” moments with respect to El Camino Real since I started this project. Here’s an example. The afternoon of September 25, 2006 I read the landmark article “What Is Web 2.0” by Tim O’Reilly. It had been written a year earlier, but I’ve always been behind in all things web. I read it, I “got” it, and was inspired to create a web site as a way finally to express this ticklish notion I’ve had for a while of celebrating El Camino Real. The name came to me like a thunderbolt: AllCamino.com. Later that evening I was browsing the San Jose Mercury News online and was astonished to read an article published that same day called “Bringing face-lift to historic road” which was all about the Grand Boulevard Initiative of Joint Venture: Silicon Valley Network, a multi-city drive to revamp El Camino into a unique, thriving street for the 21st century. It was fate; it reinforced that El Camino has a story to be told. I registered the domain name immediately. Here’s another. I registered the domain in 2006 but didn’t get around to creating this blog at the site until August 11, 2009. (I told you I’m always behind.) I accomplished this milestone with my laptop at the San Jose Library Rose Garden branch using their free wi-fi. After creating the blog, to celebrate I drove up Naglee Avenue and down The Alameda to Tee Nee Thai for lunch. 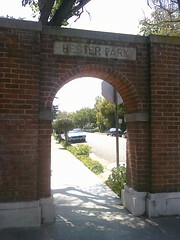 On the way I happened to see the Hester Park gates at Singletary Avenue. I had never noticed them before and I wondered what “Hester Park” meant. Was there really a park? Aha, an El Camino mystery to investigate! So after lunch I walked back up to Singletary and took some photos of the gates. I walked down Singletary several blocks to look for a park. I didn’t find one so I turned right on Park Avenue, passed Hoover Middle School and the Egyptian Museum, turned right again at Naglee and walked all the way back up to The Alameda, a big loop. Then inspiration struck again. Since it was a beautiful day I decided to walk the entire length of The Alameda from that point all the way down to the Caltrain underpass and back. That day I “did” The Alameda; what better way to celebrate the launch of AllCamino? An ice cream cone from Schurra’s consecrated the occasion. My walk all started with that happenstantial glimpse of the Hester Park gates; none of it was planned, I just followed a series of whims. 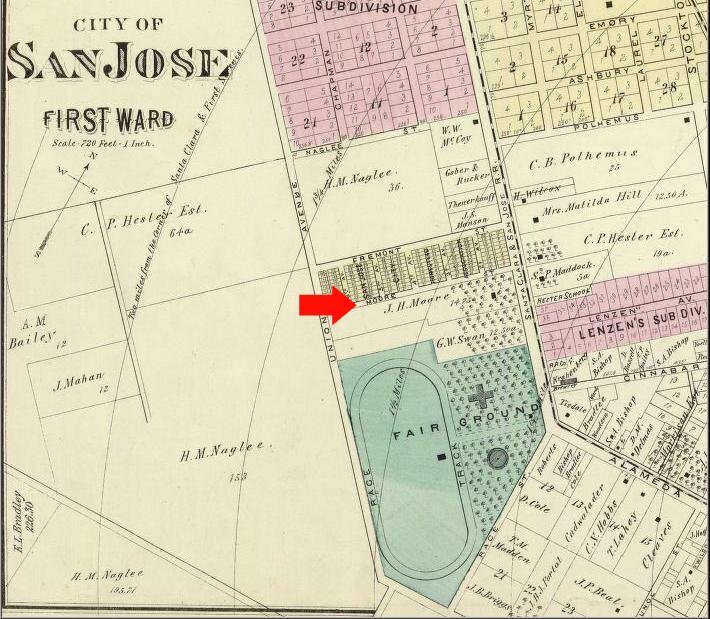 A few months later in January 2010, I was studying an old map of San Jose and realized that Singletary Avenue wasn’t always called that; it used to be called Moore Street after Judge John Hendley Moore who owned that land. My last name is Moore, no relation to the judge. So yeah, without knowing it I marked the beginning of my El Camino career at the intersection of Moore and The Alameda. Mind-blowing. Did I mention there’s a bell right there? As a humorous postscript, I discovered there is no Hester Park on Singletary/Moore after all; that was the name of an old housing subdivision there. However I did find an actual Hester Park very nearby…a teeny tiny playground adjacent to the San Jose Library Rose Garden branch, the very same branch where I launched this blog. Ba doom, crash! That’s all kid stuff. Here’s synchronicity’s grandma with respect to El Camino Real and me. Shortly after I launched the blog I went looking for books about El Camino, or at least with “El Camino” in the title. I bought two for their distinctiveness: Deep California: Images and Ironies of Cross and Sword on El Camino Real by Craig Chalquist, PhD, and California’s El Camino Real and Its Historic Bells by Max Kurillo and Erline Tuttle. The latter contains a reproduction of a 1912 AAA road map showing the length of El Camino from San Diego to San Francisco. It answered a mystery for me. El Camino nominally links the missions, but Mission San José in Fremont is nowhere near today’s El Camino Real. So what route did early Californians take from Mission Santa Clara to Mission San José? I had assumed the route ran down The Alameda to Santa Clara Street in San Jose to Alum Rock Avenue, perhaps running north along the foothills on Piedmont Road. The 1912 map suggested something different. It shows El Camino entering San Jose from the south as Monterey Road/First Street then splitting. One branch goes west to The Alameda as expected, but the other branch continues along First Street then turns east somewhere around Gish Road, then turns north on Old Oakland Road. There it continues along Main Street and Milpitas Boulevard in Milpitas, to Warm Springs Boulevard in Fremont, to Mission Boulevard which runs right to Mission San José. So there’s the route, which I like to call El Camino de San Jose. Here’s the thing. I live on Old Oakland Road. I live on El Camino de San Jose. I’ve lived there for over ten years. I had no idea about its mission connection. This knowledge did not inform my decision to buy the house, nor did it impact my interest in El Camino Real or motivations to start the blog. I had always assumed Old Oakland Road was simply the old road to Oakland, later replaced by Interstate 880, and never thought more about it than that. To tell the truth I had been feeling naggingly incomplete blogging about El Camino when I didn’t actually live or work on it. I didn’t have standing. But guess what, I do after all and I learned all this after the fact. Astounding. A 1912 map is pretty old, but it’s a lot more recent than 1797 when Mission San José was founded. I embarked on a quest to find older maps that show this road. I bought a bunch of well-known San Jose maps from eBay, Lord help me. The David Rumsey Historical Map Collection has also been helpful, however the Online Archive of California, in particular the UC Berkeley Bancroft Library collection, has been absolutely indispensable in this research. 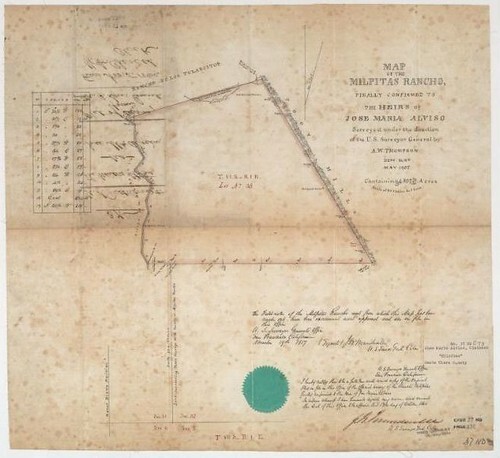 They have high-resolution scans of the California land case maps, evidence the Mexican rancho owners presented in their petitions to the U.S. government for the rights to the land. “Transfer” of land ownership is of course the fundamental moral, ethical, and legal quandary in California’s past, but the records generated shed light on state history. The following two maps are the keys for me to El Camino de San Jose. The first is a free-hand map or diseño of North San Jose dating from the 1840s. I first found it in the Historical Atlas of California by Derek Hayes. It clearly shows “El Camino Nacional” (in some maps the name changed from “Real” (“Royal”) to “Nacional” (“National”) to reflect Mexican independence from the Spanish crown) running to the San Jose pueblo from the south, then branching off as “El Camino de San Jose” to the north in the direction of the mission which unfortunately is not shown. 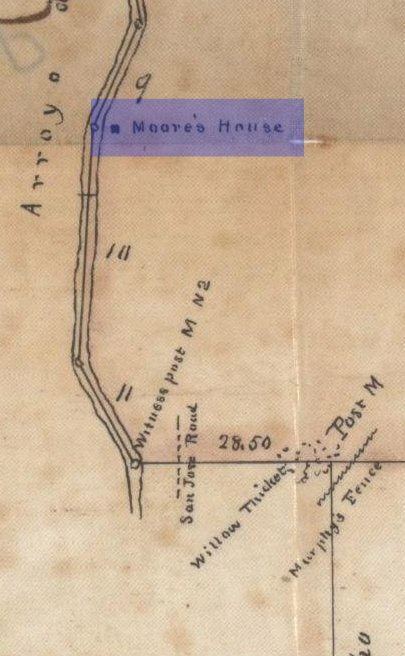 This camino crosses Coyote and Penitencia Creeks (“Arroyo de Collotes” and “Arroyo de la Penitencia“), and I contend that this road is Oakland Road today. Oakland Road still crosses Coyote Creek in front of the San Jose Municipal Golf Course, and it used to cross Lower Penitencia Creek in front of Orchard School before the creek was radically altered into submission. The next map shows only Milpitas, but this time it’s an official survey from 1857. It’s so dead-on accurate I can overlay it on a modern map and details like roads and historic buildings line up perfectly. It’s irrefutable that the road labeled “San Jose Road” on the survey is Oakland Road today. It hasn’t moved in over 150 years. To recap, my thesis is that at least as far back as 1797 the Spanish must have had a road that connected Mission Santa Clara and the San Jose pueblo with Mission San José, and that Oakland Road today is part of it. The 1840s rough diseño shows such a road labeled “Camino de S. Jose” that approximately corresponds to physical features of Oakland Road. It unfortunately doesn’t show Mission San José but there’s a suggestive ambiguity in the name “Camino de S. Jose;” it’s the perfect name for a road connecting Pueblo de San José to Mission San José. It’s reasonable to conclude that “Camino de S. Jose” on the diseño is “San Jose Road” on the 1857 survey; it’s a direct Spanish-to-English translation. The survey proves topographically that San Jose Road then is Oakland Road now, and that’s where I live. How’d the padres get to San Jose? So I’m convinced. And if that weren’t enough, this little detail from the southwest corner of the property in the 1857 survey grabbed my attention and drove the point home to me. I have a much deeper personal connection to El Camino Real than I ever realized or may ever understand. So far it’s been fun and exciting, the experience of a lifetime as I try to hear what it’s saying to me. I will henceforth widen the scope of this blog to include the historic East Bay as well as the Peninsula. I look forward to following this road. Who knows where it goes? Heidi Durrow is coming to the Bay Area this week to read from her debut novel, The Girl Who Fell from the Sky, and sign copies of the book. She’ll be at the Stanford University Bookstore on Wednesday, April 7, and at Kepler’s Books in Menlo Park on Thursday, April 8. Full details are below. You’ll note that both Stanford and Kepler’s are on El Camino Real. Meet-the-author events are always enlightening and a great way to show support for independent booksellers, but these particular readings are quite special to me. You see, I’m privileged to know Heidi. Heidi and I were Stanford undergrads together, both class of 1991. Freshman year we lived in the same dorm complex, Stern Hall. We didn’t really know each other in college, but we were aware of each other. I hope she doesn’t mind my sharing that she worked in Food Service at the dorm and her job was to swipe the residents’ meal cards through the cafeteria card reader. She was the gatekeeper of the goulash. (My roommate and lifelong brother-from-another-mother Shu Nung Lee also worked in Food Service, but he wasn’t cute enough for that kind of front-of-house duty.) So I saw her just about every day and remember her well, the pretty, petite, light-skinned girl with the startling blue eyes and fuzzy-curly hair. We never spoke beyond the perfunctory exchange of redundant thank-yous. Recently, when prompted by me, she said she thought she kinda sorta remembered me singing a cappella with the Stanford Fleet Street Singers. Perhaps she was just being polite or it might have been an induced memory, but at the risk of sounding immodest I was a bit of a campus celebrity in those days, known for my blues-inflected rendition of everybody’s favorite “Schoolhouse Rock” ditty, “I’m Just a Bill.” See, my name is Bill. That made it funny. We graduated in parallel in 1991. Fast-forward to 2006, the year of our fifteen-year reunion homecoming celebration. For every homecoming class, the Alumni Association compiles a Reunion Book to which every graduate can contribute a yearbook-like page summarizing what they’ve been up to since college. When I received my copy of the Reunion Book, I enjoyed flipping through it cover-to-cover, reading its many diverse stories. Most pages are jam-packed with photos and text because as it turns out it’s difficult to cram fifteen years of life onto a single letter-sized spread. But Heidi’s page made me pause; it stood out because it was nearly blank, little more than a Tweet. It contained a single Hollywood-style head shot, an intriguing one-line professional summaryjournalism, law, fiction writing, consultant to the NBA & NFL (! )and a URL: www.heidiwdurrow.com. That was it. She sounded like a real-life Dee Dee Thorne. I totally remembered her and wanted to know more so I went to her web site and got the rest of the story. The site has since been redesigned but even back then it was professional and engaging. I learned she was now a writer and impressively had completed her first novel manuscript, titled Light-skinned-ed Girl. (The title is a term she heard a lot growing up, an African American Vernacular English phonological construction. I learned those words in a Black English Linguistics course and I think Heidi may have been in that class too.) I learned she was working very hard in the face of constant rejection to get this manuscript published. I deduced that the site itself was a deliberate marketing vehicle to promote her work. It worked on me; I got sucked in by the nearly-blank Reunion Book page trick! I learned she was smart, determined, and talented. I learned something else. I learned she’s biracial: her father was black and her mother is white. She’s also bi-cultural: her father was an Air Force sergeant from Texas, her mother a librarian from Denmark. Having lived in the Bay Area most of my life I’ve known many biracial and multiracial people, people in mixed marriages and relationships, and families built up from cross-racial adoptions. I never gave their stories much thought though; I took them for granted. I was certainly aware that mixed relationships were often fraught with palpable difficulty from both sides during the racially-charged sixties, and that cross-racial adoptions require special sensitivity and cultural effort. But I never stopped to think about what it means to be mixed. Heidi had, a lot, and she wrote about it, a lot, with eloquent honesty. On her web site she had a link to her blog, also called Light-skinned-ed Girl. She didn’t have all the answers because no one possibly could, but she fearlessly asked aloud the questions she lived every day. I stayed up very late that night reading everything on her site. I read a short excerpt from her manuscript, and longed to read more. I read every posting on her blog and every comment from the community that was starting to build around her. I was hooked and inspired. Race and identity make up a large part of her writing, but the larger story which emerges is about the joys and challenges of living a creative life. Her novel is the heroine of that story and comes to a happy ending. On May 31, 2008 Heidi exuberantly announced that her manuscript had won Barbara Kingsolver’s Bellwether Prize for Literature of Social Change, a prize which includes recognition, cash, and most splendidly publication. Her book, renamed The Girl Who Fell from the Sky, was published by Algonquin Books in February, 2010. But I got it in January. How? Rewind back to 2006. (Get used to nonlinear narrative; it’s an important literary device in her book.) I live in the Bay Area so I never miss my Stanford Reunions and the fifteenth was no exception. I was hoping Heidi would be there so I could make her acquaintance but she wasn’t. After it was over I slipped out of my comfort zone and emailed her out of the blue to let her know how much I enjoyed her manuscript excerpt and her blog. I was reading her blog regularly and in fact hers was the first blog I ever followed and the first to show me how the technology worked and what it was capable of. That same year I first had the idea to create AllCamino.com. I had various big plans for it but thanks to Light-skinned-ed Girl I came to understand that a blog would be the heart of it. 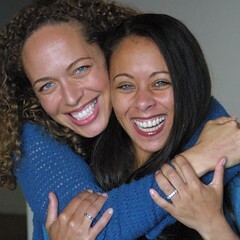 In 2007 Heidi and her longtime sister-from-a-different-mister Fanshen Cox created Mixed Chicks Chat, an award-winning weekly live call-in podcast dedicated to telling the truths of the mixed experience. Fanshen, an amazing actress, filmmaker, educator, and friend, is also mixed. Of course I listened to their podcast religiously (again the first I ever followed) and participated in the off-air chat room, calling in when I could, and before long found myself thoroughly involved in the wonderful burgeoning Mixed Chicks community, which is bizarre because I am neither mixed nor a chick but somehow it makes sense. Drop by some time; I’ll introduce you around. In 2008 these two amazing women with the help of a tireless cast of volunteers produced the first Mixed Roots Film and Literary Festival, an annual event at the Japanese American National Museum in Los Angeles celebrating Loving Day with films, readings, workshops, and family activities focusing on the untold stories of being mixed. I flew down to L.A. for the inaugural festival to help out and meet them both in person after months of amiable but purely online interaction. I tell you all this (a) to plug the Mixed Chicks, and (b) to paint a picture of my high regard and ongoing involvement with Heidi and Fanshen. Heidi’s publisher announced the book would come out in February, 2010, Black History Month of Barack Obama’s second year in office. Perfect. In January the advance copies were circulating, getting rave reviews, and the publisher was pushing it hard to booksellers. Awesome. Not content with their considerable efforts however, I went to the Stanford Bookstore on January 16 (I was in the area) and asked their information desk if they were going to carry it. The employee wasn’t sure so I got the contact info for their buyer. Cool. I was about to head home, when I succumbed to a slightly crazy urge to go a little further north to Kepler’s Books in Menlo Park. I asked their information guy the same question, were they planning to carry The Girl Who Fell from the Sky when it came out the following month. He typed a search into his computer then replied, “We have it in stock. It’s on this new releases table right here.” Sure enough, there it was, nearly a month ahead of the release date. I was flabbergasted. Incredulous. Elated. I couldn’t believe my good fortune, having the honor of being among the first on the planet to buy the book. It was Cosmic perfection that this happened on El Camino. I bought three copies (I gave two away to family), DMed Heidi on Twitter, raced home, and finally, three and a half years after I first read the teaser from the manuscript, read the full novel, finishing it in three days. This post is quite long so I won’t talk too much about the novel itself. It has been covered at length in national press including the New York Times, Washington Post, Christian Science Monitor, and NPR. TV is next; Oprah, we’re comin’ for ya. It’s lighting up the blogosphere and vlogosphere, and it’s climbing the sales charts. This is a fun time. I will say this: I loved the book. It’s beautifully written, it tells an important, heartbreaking story, and I’m incredibly proud of Heidi. There were passages, including the climax, where time seemed to stop as I was reading because I was so consumed by the prose. This is high praise for art in any form. The most valuable gift to me is that because I’ve been getting to know Heidi these past few years, hearing her voice and her stories, I was able to inhabit the book in a way I’ve never experienced before. I knew what she was talking about. Go get it and read it; it’s widely available online and at your favorite independent and chain bookstores. Join our online community. 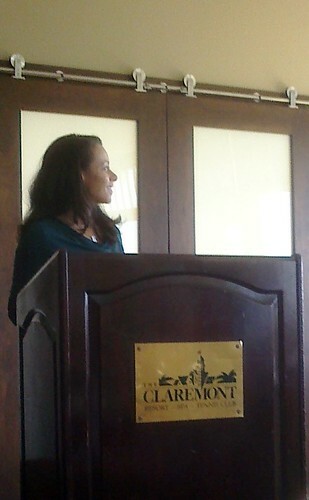 If you can, go to her readings this week or check her book tour schedule for one near you. Seeing her eyes, hearing her voice, and getting her autograph will enhance your enjoyment of the book. Kepler’s won the day but ever since I read those pre-published manuscript pages in 2006, I’ve visualized Heidi reading and signing her books at the Stanford Bookstore. The bookstore cuts an elegant symbol, the busy crossroads at the heart of the campus where we intersected only incidentally twenty years ago but left just enough of an impression to build a friendship on years later. Now that the vision is coming true, it brings full-circle the arcs of our two stories, but not to closure. This Ferris Wheel ride isn’t done turning. You are currently browsing the All Camino blog archives for April, 2010.